Cindy's Stitching Korner: Just a Bit of Progress! Just a Bit of Progress! 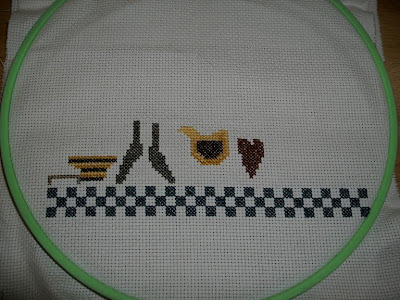 Well I have made some progress on Cross Stitch Collector! This week has just been crazy and I have not had a lot of time to stitch, but a little time is better than no time at all!!! Hopefully next time the chicken will have legs and the plant have, well a plant to show! Anyway, hope everyone is doing well. I am fixing to get started on stitching some PIF's and other exchanges soon too! This is looking really good and I love the saying. Britty Kitty III - #2 Finished!